Source: Washoe County School District website. 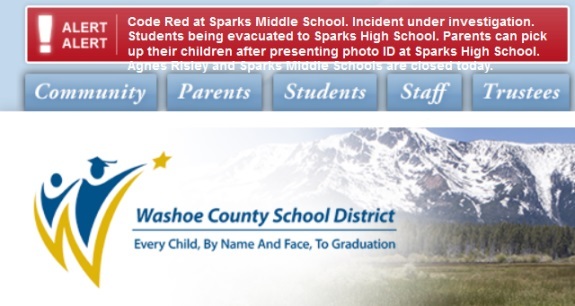 BULLETIN: The Washoe County School District in Nevada has issued a “Code Red at Sparks Middle School” and the Sparks Police Department is reporting a “shooting” incident at the school. Early details are sketchy. Sparks is situated near Reno, Nev.
Nevada today is contending with another shooting with multiple victims. The AP is reporting that a shooting early this morning at an after-hours club in Las Vegas left one patron dead and two employees wounded. Quick note: The danger at the scene reportedly has ended. In the early stages, local media are reporting that two people are dead. 7:16 am, Emergency calls were received from students and staff at Sparks Middle School about an active shooter on campus. – Local law enforcement, fire services, and EMS immediately responded and determined a shooting took place on school property. – Two pronounced dead at the scene, and two were transported to Renown Medical Center. – The suspect is neutralized. The teacher has been identified as Mike Landsberry. In the United States (at least), it is said there are no “former Marines,” which is to say, once a Marine, always a Marine. America appears to have lost a dedicated teacher and military man at the hands of an armed middle-schooler — at the school itself.